So much change going on around the world, seasons and all kinds of things including some wild colourful sunsets lately. But Friday still is the day we all look forward to see what everyone in Sky Watch Friday is sharing with us this week. All this sharing makes the world feel like a smaller and friendlier place. Have a great weekend everyone. What a beautiful one! This one is worthy of painting! Your photos for Skywatch Friday are so inspiring, I keep meaning to join in but forget to take a pic every week!! I love the quotes you post with the pics, really wonderful, thanks. Very well said, it is amazing that we all come together on this day to share photos. 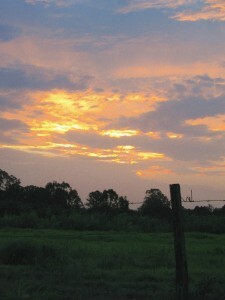 Beautiful sky you have here~Stunning!<BR/><BR/>Mine is, <A HREF="http://yennygirl.com/?p=3697&quot; REL="nofollow">HERE</A>. Very nice sunset indeed! <BR/>The good news is not all change is bad. Let’s hope for the best. ;-)<BR/>Happy Sky Watch! Very pretty Sky Watch shot!<BR/><BR/>Happy Shooting!!! Love that hint of yellow in the clouds – gives us hope! A soft beautiful sunset matching your lovely words, Amanda.<BR/>Have a nice weekend. Some very wise words from Mr. Gandhi and a gorgeous picture from you. Awesome colors. Love the light in the sky and the barbed wire fence. Beautiful contrast. Lovely. 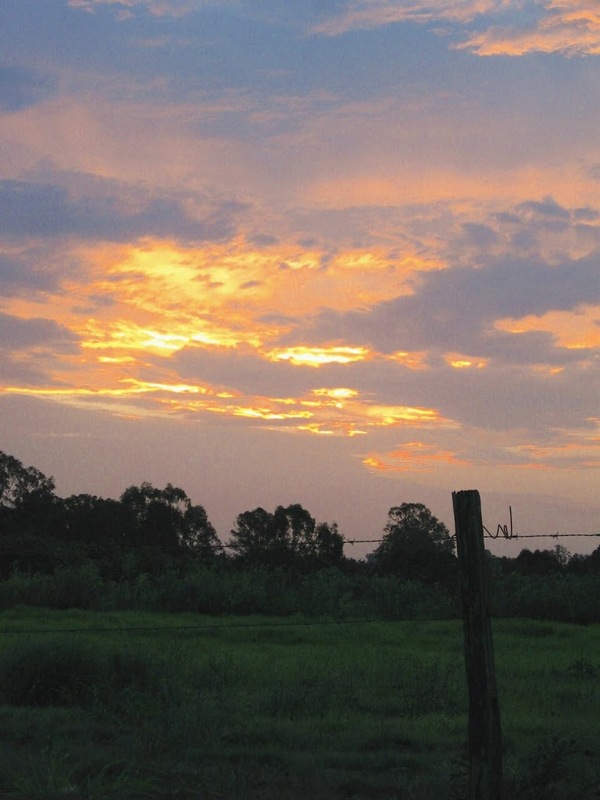 I love this scene with the fencepost in the foreground.<BR/>Your post just below is a gorgeous sky as well. I love the subtle coloration of the photo and the quote is simply perfect for the times we are in. We need to take heed of Gandhi, listen to wise is always a wise decision. Beautiful skywatch photo. Very calming effect. Have a great weekend. Lovely sky as usual! You seem to be having lots of nice evenings! Gorgeous photo! Must have been so amax=zing to see in real life! Where in Melbourne was that taken? I live in the same city …..<BR/><BR/>We’ve had some great skies recently. This is so soothing to see at the end of the day. You’re very lucky to have this view. Pearl: I do like your muti-colored sky. The way the yellow comes through is so different. <BR/>That is a nice write-up you have for SWF. Just came back to say thanks for stopping by. I am grateful for your wonderful comment. amazing shot! <BR/><BR/>Mine’s <A HREF="http://rhoencatolico.com/colorsoflife/?p=193&quot; REL="nofollow">HERE</A>! Thank you for your comments! Wonderful picture, like a painting! Really beautiful sky, well done to captere it. I have been enjoying a rainy morning looking at so many gorgeous sky photos! Your bright sunset photo is wonderful. Both our beautiful. I’m not sure if I like sunrise or sunset.<BR/>Both our real pretty.<BR/><BR/>Coffee is on. wonderful photo and perfect quote! Well, it’s Monday already, so thanks for giving me a little encouragement that Friday will come again! Beautiful photo. Perfect quote to match the perfect setting. Beautiful – looks just like a painting. Very nicely captured – love the colors.